Here's an interview with Nicolette Larson from thirty years ago in 1983 when she was playing a concert in Vancouver. Nicolette Larson:When he did American Stars 'n Bars his initial concept was to get two unknown singers and do the album with them, but he tried that and it didn't work at all. And then he decided to take the other route and get Emmylou and Linda, but Emmylou wasn't available to do it, so she and Linda recommended me. Neil kind of functions on cosmic operations, you know, and that was cosmic enough for him. If everyone had recommended me then I was supposed to work with him. So Linda and I went up to his ranch and sang backups on that album, and then when he did Comes a Time he called me again to come and sing on it. Did you release your own version of "Lotta Love" before he did his? 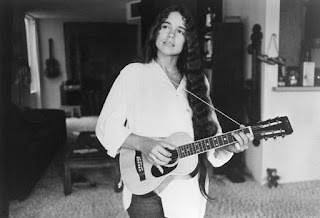 Nicolette Larson:Well, this is what happened. He recorded it first, and I heard it and said "Gee that's great. How come you don't put that song out?". And he goes, "Oh, do you want it? It's yours." That was what he said with every song of his that I admired. It was kind of like, "Don't ask me why I don't put this out. You want to put it out, you put it out." So I recorded it, and got it all ready to put out, then at the very last minute he changed his mind on Comes a Time and put it on that. So we both released it the very same day, actually. I changed it around quite a lot from Neil's version. His is a lot different with all the "la la la la's" at the beginning. Full interview at 30 Years Ago: Nicolette Larson talks Neil Young, Eddie Van Halen, and roommate Linda Ronstadt | Georgia Straight by Steve Newton. Also, see Neil Young News: Nicolette Larson's "Lotta Love" & Neil Young. "some of them are with me now...some of them can't be found..."
I thought American Stars & Bars back-up singers were Linda Ronstadt & Emmylou Harris???? time to check that Thrasher!!! Thanks Jonathan. Don't scare us like that. Nicolette also covered an otherwise unreleased Neil Young song entitled "Barefoot Floors." I'm not sure when it came out but it was on an album of lullabyes that she did. The album that Ray was referring to is called "Sleep Baby Sleep," and it first came out in 1994. I found it on CD @ Amazon.com in 2006, and we used to play it for my babies every night. It worked so wonderfully! Nicolette was one of the sweetest singers that I've ever heard. I agree that her voice blended with Neil's like no other. I miss her so much! I can't believe it's been 30 years since I first heard her! "The following week Ronstadt and Larson cut their vocals for Young's American Stars 'n Bars album at Young's La Honda ranch — the two women were billed on the album as the Bullets — and in November 1977 Young invited Larson to Nashville to sing on the sessions for his Comes a Time album, an assignment which led to Larson's being signed to Warner Brothers, an affiliate of Young's home label Reprise." "A track from the Comes a Time sessions featuring Larson: "Sail Away", was included on the otherwise live Neil Young album Rust Never Sleeps released in 1979." "In 1992 Larson reunited professionally with Neil Young to sing on his Harvest Moon album; in 1993 Larson was featured on Young's Unplugged. Larson also provided vocal accompaniment on "The Little Drummer Boy" and "Greensleeves" the two tracks Neil Young contributed to Seven Gates: A Christmas Album by Ben Keith and Friends (1994)."